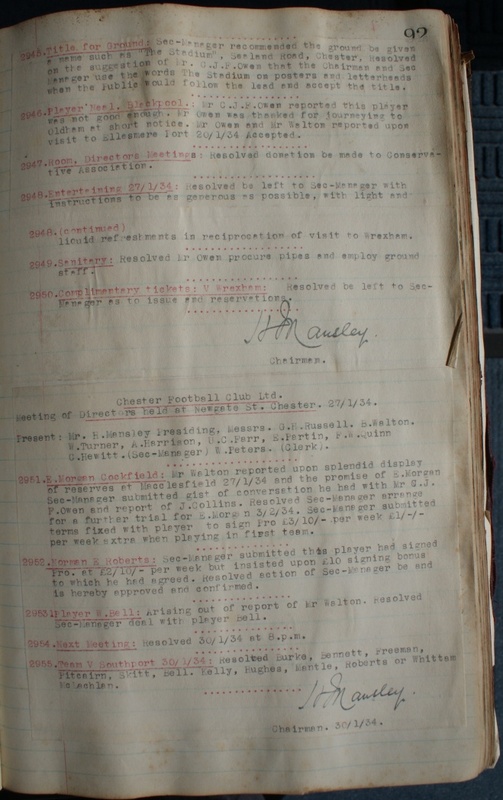 A look through the minutes of the meetings in the 1930s ledger turned up some interesting information about the club. From my point of view the most fascinating revelation was Charlie Hewitt’s position at the club. Hewitt’s job title at Chester was secretary-manager but I never appreciated how this role worked. Certainly I envisaged him as primarily a football man who handled some of the administration. However, the meeting minutes shed a different light on affairs and it seems that the balance was tilted more towards the running of the club than I imagined. Hewitt was born in the north-east in 1884 and had an unremarkable football career spending short periods with Middlesbrough, Tottenham Hotspur, Liverpool, West Bromwich Albion, Crystal Palace and Hartlepools United. He took his first managerial role at Mold before spells in charge at Wrexham, Flint and Connah’s Quay. He became Chester’s first manager in 1930 and lead them into the Football League in 1931 after an incredible season in which they scored 170 goals in the Cheshire County League and finished runners-up to Port Vale Reserves. The season was notable for the quality of players attracted to the club with Chester taking advantage of the loan system and bringing in experienced Football League players like Arthur Gale, Frank Creswell and Dave Morris. The minutes show that Hewitt spent a lot of time scouting for players and he would make transfer recommendations to the board but when it came to selecting or organising the team his input was more limited. I had read in the past that his philosophy was to find the right man for the right position and that seems to be the key to his success at Chester. He didn’t believe in using confusing tactics or giving a player a role for which he had no experience and as far as he was concerned it was a matter of getting the team forward to score goals in as straightforward a fashion as possible. Hewitt employed a number of trainers, like Jock Simpson and Hughie Ross, whose main job was to get the players fit, but on reflection I wonder how significant it is that in the majority of team groups in On The Borderline it is the trainer rather than Hewitt who appears in the team photograph. 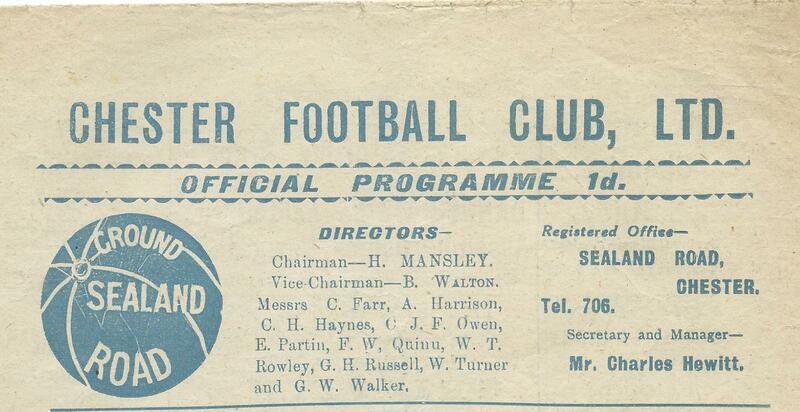 In those early Football League days Chester employed a selection committee and this seems to have caused some conflict between Hewitt and the board of directors. 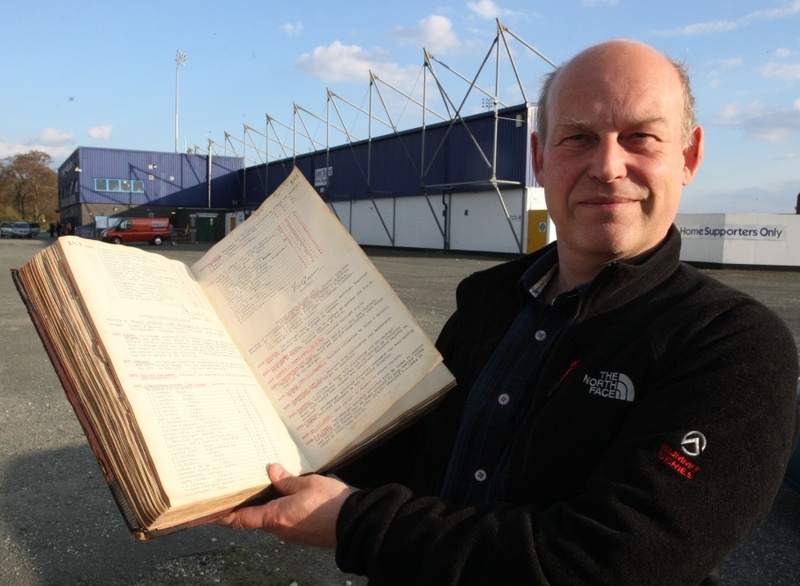 An example of this can be seen in October 1933 when the committee met to select the team against Stockport. The minutes report that Hewitt recommended Gerry Kelly play in place of Sammy Armes who had picked up an injury but the selection committee was divided on who to select and in the end it was resolved to refer the position of outside right to the full board of directors which must have been extremely frustrating for Hewitt. In the end Kelly played and scored with Chester drawing 1-1 but this coincided with a run that saw the club win only two of the first 12 games of the season. In a meeting at the end of October one of the directors expressed his view that the club would only start to win matches when the board accepted the selection recommendations of Hewitt. The secretary-manager certainly made his opinions known when he told the board where he thought the problems rested saying that Kelly would not make a centre-forward due to his not liking the position. He also suggested other changes in the starting line-up stating, amongst other things, that he was dissatisfied with the play and captaincy of Harry Skitt and accusing Frank Cresswell of malingering. The situation appears to have been partially resolved the following week when the board agreed to cease with a selection committee and act on the recommendations of the secretary-manager. Although this seemed to place more power in the hands of Hewitt it still left the final decision with the board as can be seen when the decision to select Skitt against Darlington a few weeks later was passed by a vote of six to three. In fact it could be argued that the board were often in a better position to judge current form than Hewitt who often appeared to be on scouting missions. In his time at Millwall (where he became manager in 1936) it was noted that he was rarely seen on match days which seemed to continue the trend he began at Sealand Road. Interestingly, when he took up the managerial position at Millwall, he insisted on having full control of affairs which is something he did not get at Chester. Clearly Hewitt was heavily involved in transfer activity but he also appeared to run all the day to day operations at the club. He was a trained accountant, in charge of all the financial books, as well as handling matters like ticket and travel arrangements, insurance and advertising. In June 1933, the board registered appreciation for Hewitt on his book-keeping and accountancy skills. In these days of performance related payments it is notable that, at one board meeting, Hewitt requested that he be paid commission on the advertising in the ground as well as a percentage of any transfer fee received. This request seems to have been initially ignored but when it was brought up again at the end of the year the board agreed to his request for a percentage of the advertising revenue but, at least initially, turned down the transfer fee proposal much to Hewitt’s dissatisfaction. When the secretary-manager moved to Millwall in 1936 he was replaced as manager by Alex Raisbeck with clerk Billy Peters took over the role of secretary. Hewitt himself had a big impact when he first moved down to London taking Millwall to the semi-final of the FA Cup followed by the Division Three South title the following season. However, his time at the Den ended in disgrace when he was suspended for six months for making illegal payments to players before being sacked soon afterwards in 1940. 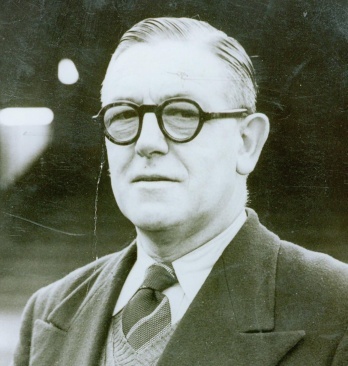 After serving with the Royal Navy during the war he returned to football as Leyton Orient manager in 1946 but resigned less than a year later after a disagreement about signing players. Although he was reinstated at Orient he, perhaps surprisingly, returned to Millwall in August 1948 after two undistinguished seasons at Brisbane Road. He was less successful in his second spell at Millwall and his autocratic style did not go down well as the team struggled. An abrasive character he was sacked in Janaury 1956 and it was reported that the players were so relieved by his departure that most of them went out for a celebratory drink together. In the 1960s Hewitt made an unsuccessful attempt to join the board of directors at Chester and died shortly afterwards, in Darlington, in December 1966. Charlie Hewitt’s time at Sealand Road proved to be one of the club’s most successful periods but his role incorporated activities not normally associated with today’s football manager. His talent seems to have revolved around wheeling and dealing in the transfer market rather than team selection and tactics. This approach would explain why very few local players made a breakthrough into the first team in his time in charge. Conversely his influence off the field appears to have been much greater than expected at a time that Chester were making the transition from the Cheshire County League to the Football League. One of the most interesting items of club memorabilia I have ever seen was recently loaned to Chester FC chairman Tony Durkin. A 336 page hardback ledger, spanning the period from November 1932 to February 1937, was in the possession of a relative of former clerk and secretary Billy Peters. It makes fascinating reading as it covers board meetings with subjects ranging from club finances and team selection down to travel arrangements and the provision of fire extinguishers. I never appreciated that the ground had formally been entitled “The Stadium” in this way. I had presumed that the name had been adopted by default after its construction in 1906. Given the circumstances I am surprised that such a bland, unimaginative name was endorsed. The naming may have been prompted by the imminent arrival of the Greyhound Stadium, which was built next door the following year, but I would have thought that this would have prompted a more creative title. Although The Stadium may have been the official name I think it is fair to say that it never fully caught on. I always though of it as Sealand Road and this was always how the ground was known in footballing circles.